Growing up in the Bay Area, Feldo Nartapura had no intention of becoming a chef. When his career took an unexpected turn, he made ends meet serving up family recipes right on the sidewalks of San Francisco. 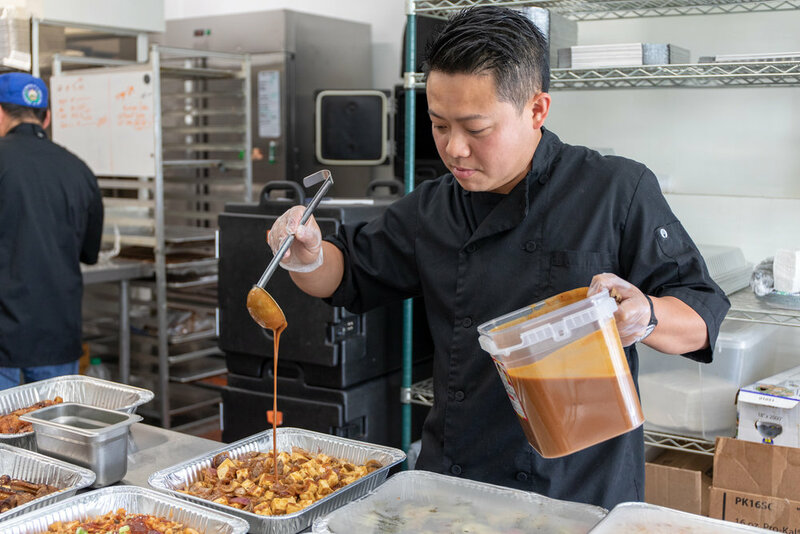 In an our interview below, Feldo explains how he turned his satay street stand into a booming catering business. What are some of your earliest food memories? One of my favorite memories ironically is having a bowl Luck Charms cereal for the first time in my life. Moving from Indonesia to the States at the age of 5, I never had cereal before. I remember it so vividly: how deliciously sweet the milk was and how fast I scarfed it down. As immigrants, we adapted to American life by eating burgers, hot dogs and fries. Can you tell me about how you see the connection between food and storytelling? Additionally, what does cooking with family mean to you? Growing up, my parents were always working, so I had to fend for myself with food. I can recall particularly that my dad always wanted Chinese or Thai food. With my small allowance, I frequented the dollar menu in fast food joints. When I got older, my dad started cooking satays for his Indonesian community group of friends and family. He took pride in Indonesian food and told me stories of how he grew up eating satays and nasi goreng (Indonesian fried rice). In my wife’s family, a potluck dinner was a weekly Sunday ritual. What connects my Indonesian identity and my wife's Filipino family is the constant sharing of food. It is about eating at the table with friends and family, catching up and discussing the history of the food itself. When I was young, I wasn’t as involved in cooking. Working in the food business later on, cooking with family was a nice break from the catering kitchen, where you scrutinize over every detail. At a family potluck, there’s no judgement. It’s all good. It’s where I can try different flavors and techniques to later incorporate into the business. Can you tell me about your history working in the food industry before starting Sataysfied? It’s funny. When I was a kid I never knew what what my calling was. One of my first jobs was scooping ice cream at Baskin Robbins. I went on to work as a grill cook making Philly cheesesteaks, an In-N-Out cashier, and even as a pizza delivery guy. At the time, these jobs simply provided spending money so I could to pay for things like high school prom or college tuition. I never knew that these jobs would end up giving me the background and context of running my own food business. The worst part of food industry jobs is having to constantly be on your feet and how you smell like the food that you are cooking after you get off of work. However, the best part of a job in the food business is that you are able to give something back to the customer: a piece of happiness by feeding them a delicious meal. What was it like making the transition from cooking for yourself and friends to actually establishing a business where you were selling to customers? To be honest, before Sataysfied, I wasn’t so much cooking, but was eating out a lot. It wasn’t until I actually started the business that I began learning and honed my skills as a cook. I think with everything in life, when you start doing something more often and get good at it, it’s a natural progression to really like it. That’s what happened with cooking for me. I fell into cooking and selling food out of necessity. I had been laid off from my startup job and needed to pay rent. My parents taught me the satay recipe and since people in the Mission sell bacon hot dogs all night without much hassle from the police, I could do the same with satays. Plus, they’re delicious after a drunken night. One of my first nights I was pleasantly surprised that in 2 hours of work I made $200. I said, hey that’s not bad! I had to buckle down and work, so selling satays on the streets was something I just jumped into. I never thought it would get to where it is now. This all started as an act of survival and is still thriving today. Pretty cool! Have you traveled to Indonesia or the Philippines recently? In 2015 my wife and I took an amazing honeymoon trip for a month, traveling to Indonesia and the Philippines. We were able to learn deeply about our culture since we only knew a superficial level having grown up in America. We ate at a lot of authentic restaurants tasting dishes like slow cooked Bali pork ribs and Nasi Goreng (Indonesian fried rice). We tried BBQ fish, freshly caught, with Indonesian spices and Chicken Adobo in coconut milk. We even experienced a family meal in the Philippines where food is served in a big banana leaf with rice, chicken, vegetables etc. We all shared and ate with our hands! There are just some things a cook book cannot teach. Nothing compares to a full hands-on experience. One of my favorite memories is eating Halo Halo in a coconut shell in El Nido, Philippines. It was amazing to be able to eat a delicious sweet coconut desert mixed with authentic Filipino Jelly... and in front of a beautiful ocean and blue sky, it was great. Check out some of our favorites from Feldo and the Sataysfied team!